President Muhammadu Buhari of Nigeria said Nigerian authorities prefer to negotiate with Boko Haram group which abducted schoolgirls for the release of the hostages rather than resorting to military action. Nigeria prefers to have the schoolgirls abducted by Boko Haram from Chibok and Dapchi back alive, and that is why it has chosen negotiation, rather than a military option, President Buhari told US Secretary of State Rex Tillerson at a meeting in Abuja on Monday, according to a statement released by the presidency. The two men discussed the use of negotiations to bring back the abducted schoolgirls, the statement said, adding that Nigeria was working together with international organizations and negotiators, to ensure that the girls are released unharmed by their captors. Female students have been reported missing following a Boko Haram attack on Government Girls Secondary School at Dapchi town in Yobe state last month. The kidnapping is one of the largest since the jihadist group abducted more than 270 schoolgirls from the northeastern town of Chibok in 2014. In September 2017, some 100 Chibok girls were reunited with their families after the Nigerian government shelled out over €2 million in ransom payments to Boko Haram terrorists. 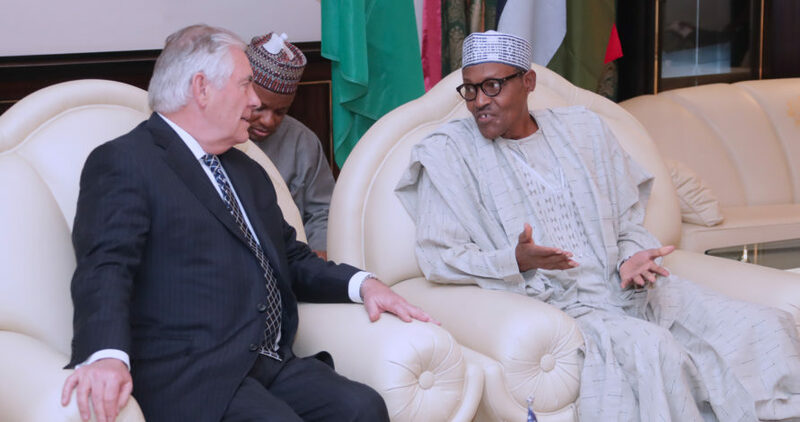 Buhari and the US Secretary of State also discussed counter-terrorism efforts and humanitarian issues in Nigeria’s North-East and in the Lake Chad Basin. Means to advance peace and security, promote good governance, and spur mutually beneficial trade and investment were also brought up at the meeting. Posted by Geraldine Boechat on March 12, 2018. Filed under Zoom. You can follow any responses to this entry through the RSS 2.0. Both comments and pings are currently closed.